SpinAddikts sessions train in multiple heart rate zones from aerobic to anaerobic with a combination of workouts to challenge and optimise your strength and fitness. Cyclists, triathletes, runners, skiers, rowers and anyone needing a structured and focused workout to enhance performance will benefit from the sessions. Heart rate monitors are highly recommended. Please make sure that you fuel up before the sessions! SpinAddikts 60 min classes have proven to burn up to 1100 calories and the 90 min Endurance sessions burn up to 1700 calories. SpinAddikts sessions are more intense than most regular indoor cycling class- in addition to the high calorie expenditure rate, these sessions burn more fat and boost your metabolism! 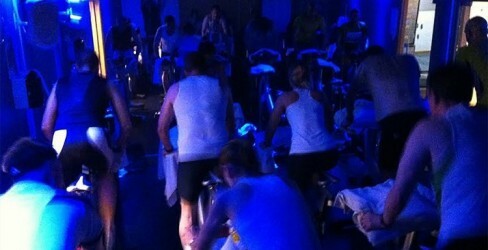 SpinAddikts Regular incorporates a little of everything, you will sweat to the hour-long ride with a variety of drills. SpinAddikts Interval is intense, the hour-long workout is structured to alternate between working into higher intensity heart zones reaching anaerobic threshold followed by periods of lower intensity work. This workout will improve your recovery, your ability to train at or above your anaerobic zone, and enhance your performance in speed and power. This class is the most advanced; it is essential to have a strong aerobic base before starting to train at this intensity. SpinAddikts Endurance is an extended ninety minute workout. You will be working with the goal to increase aerobic capacity and to resist fatigue. This session gives us the time to work on improving endurance in different zones as well as challenging your ability to sustain your power for longer. A 2.5 hour special endurance ride is held every six weeks. SpinAddikts one-on-one are available at all levels, from beginners to trained athletes. The sessions are designed to address your specific needs- to lose weight, improve cardiovascular fitness, to improve form and technique, or to prepare for an upcoming event. One-on-One SpinAddikts sessions can be combined with strength training sessions (see Frances PT). Frances will tailor your training programme to help you achieve your goals realistically, efficiently and safely.